Located in the coveted subdivision of Destiny West, Yellow Bird boasts spacious patios off of each bedroom. Recently rennovated and updated!!! Check back with us soon for new flooring pictures to go with other recent upgrades! 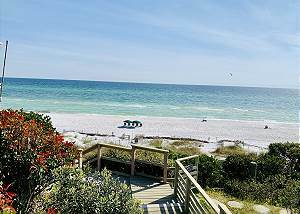 This Gulf facing condo is just a few steps from the snowy white sands of The Emerald Coast! Enjoy gulf breezes from your patio! Gulfview has 2 pools and a hot tub for your convenience in case of red flags! Saturday to Saturday rental peak season. Like new townhome with all new furnishings and electronics! Vacation in Luxury, right next to the pool, and less than 2 minutes to the beach! Saturday to Saturday rental during the peak season! Relax and enjoy a perfect beach vacation or hop on your bike and you are just minutes away from Seaside or The Hub! Plenty of room to spread out and lots of space on the decks to take in the sun and enjoy the view of The Gulf! Community Pool next door! This condo has been completely remodeled from top to bottom, front to back! Amazing views of the Gulf from the Kitchen, Living Room, and back patio! This property is a beach lovers dream! You can hear the surf from the front porch! This beautifully decorated home is just a 2 minute walk to the beach! With 6BR's and 5BA's there is plenty of room for 21! This house was made for weddings and reunions! With an abundance of living space and only a 3 minute walk to the beach, what more will you need? Multi-family, reunion, or large group friendly , there is plenty of room to spread out! Friday to Friday rental during the peak season! "The Beach House" is located on the beach between Seagrove and Alys Beach. This amazing home will have you feeling that you are all alone on the beach. Multiple levels of decks to soak up the sun and enjoy sunsets on lead down to the sugary white sand. Located in the new gated Emerald Waters Village, this exquisitely decorated house is just 2 houses from one of the 2 community pools. The beach is just a short walk away! Saturday to Saturday rental during the peak season!